Looking for a special gift this New Year? Wind-Flower Web Design is in the process of developing phone apps, but in the meantime we wanted to share our top suggestions for educational iPhone apps for kids. These apps can develop children's innate love of art, music, reading and learning in general! If you have other apps to recommend, please email us, join us on Twitter or on Facebook. This App is really great because preschoolers can start tracing their letters. Lowercase letters, Uppercase letters, Numbers, and even short Words are all included in this App. Children listen to the letters, numbers and words as they learn how to write. This App includes coloring options too! Highlights: The tracing sound effects. This App is fun for younger preschoolers – basically the App turns your iPhone into a rattle. Music and colors change as the phone is lightly shaken. Highlights: Visual effects make it part rattle, part kaleidoscope. 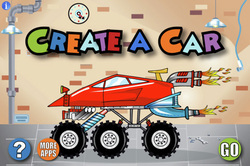 This is a fun and creative App for kids to design their own car. All the car designs can be saved in a garage, and you can create multiple garages to store everyone's car. Highlights: Some parts 'move' when the car is started. This is a fun App to create a cupcake and decorate it with dozens of yummy toppings. Then, you can send the recipe to family and friends too so they can share in the delicious creations. Highlights: Setting the timer, shaking the cupcakes out of the pan, and blowing out the birthday candles. Note: More Pizza! is a similar App from the same designer. Develop your child’s inner artist with this fun App that lets you or your child create any picture with different brushes and colors. You can also email the artistic masterpieces your child creates. Highlights: The stamps with sound effects. These are great Apps for learning spelling because it turns spelling words into a fun puzzle game with pictures. 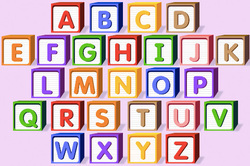 Children see a picture of a word and move that word’s scrambled letters into the letter spaces. When all the letters are put in place, you hear the word spelled correctly and watch the picture animate. Highlights: The completed puzzle sound effects. Here is a great App for recognizing words, numbers, colors and shapes, as the school of fish dash this way and that. Also, this App is engaging and interactive and the fish change shape, direction, color when touched. The ABC song and matching game included too. 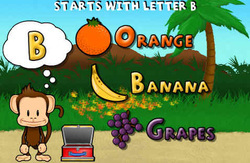 This is another great App for developing beginning literacy for letters, numbers and animals. The letter and number activities have two levels, and other activities include catching and taking pictures of animals while on safari. Highlights: Catchy music. Set the App to 1 of 3 modes: Flashcards, Quizzes, or Tracing for some learning fun! Clear graphics and easy-to-follow directions are highlights of this App. Sing along to six songs: ABCs, 12345, Incy-Wincy Spider (the Australian version), Row Row Row Your Boat, 3 Little Monkeys, and Twinkle Twinkle Little Star. Plus the lyrics are written out for reading. Develop your child’s inner artist with this creative App that lets you color in Curious George pictures with different colors. You can also email the artistic masterpieces your child creates. Highlights: Color splash sound effects. This is the classic Little Red Hen tale with the little red hen baking bread read in an adorable Australian accent, Spanish or Chinese! Start playing the piano at any age. The piano includes exactly one piano octave, which is enough to tap out Mary Had a Little Lamb and maybe Chopsticks. Highlights: It looks like a real piano! One of the best Apps for preschoolers – this one has different activities that alternate during the game: a matching concentration-type game, a sliding puzzle, a choose-the-color game, a first-letter recognition game, and pick the sticker. Highlights: Funny monkey laugh. Blow into the microphone to hear music from this real flute-like musical instrument. Read more about the history of the Ocarina. It sounds like a little flute and you can even hear other people's compositions. Each page is one verse of the classic Old MacDonald song, and the objects on the pages are interactive. So while each verse of the song is played, children can click on the objects to watch them move and make a funny noise. This app is great for teaching children to read! 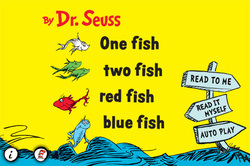 One Fish Two Fish is an interactive version of the classic Dr. Seuss book. Children can choose to have it read to them or read it themselves. Every object in the book when touched writes & says the name of the object. This is a great app for learning how to count. 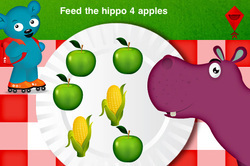 Colorful graphics illustrate math concepts such as addition and subtraction on three levels. Each level has many different activities in a scene that children can scroll through and complete. This is a great one for even the youngest preschooler. Children learn the animals in a fun interactive way. 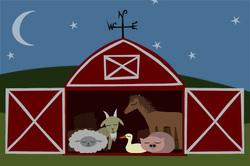 Each time you knock on the barn door, an animal pops out, makes their animal sound, then goes back into the barn. After viewing all the animals in the barn, it gets dark and the animals go to sleep for the night. It’s a new day for books! This very interactive classic tale of Beatrix Potter’s Peter Rabbit is read to you one page at a time, the words are highlighted as they are spoken, and all the words and pictures are clickable. One of the Apps that uses phone movement to guide the action on the screen. Catch falling flavors of ice cream and dodge tomatoes and onions. Highlights: Watching the background change as you get higher. Dozens of different puzzles! 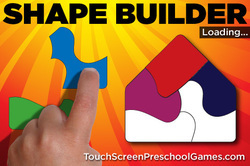 To play, push each puzzle piece into the puzzle, and then discover what’s hidden in the shape of the puzzle. Highlights: Finding out what the new puzzle is. This App makes writing high-flying fun! Write your letters, words or shapes on the screen, then watch the plane as it writes what you wrote in the sky! You can also type in words and the plane takes off into action too. 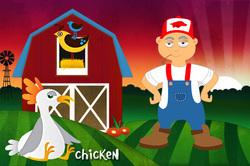 This is a great adaption of the fabulous Starfall.com website. The App is focused on learning the alphabet with varied engaging activities, while the website is perfect for preschoolers as well as beginning readers. Highly recommended. A great App based on the award-winning PBS show Super Why with Super Why, Princess Presto, Wonder Red, and Alpha Pig. The four main games practice reading, spelling, rhyming and writing and more! Highly recommended. This is the App version of the Connect-the-Dots game. Children learn number recognition as they click on the numbers in order. Then at the end of the puzzle, the hidden image appears! Highlights: The musical effects. There are multiple Apps by the same designer to teach vocabulary recognition: All the guessing games involve hearing a word and clicking on the matching picture. Lots to choose from: Shapes, Letters, Colors, Numbers. Highlights: Pick your own stickers. Create your own music simply by pushing the white mini-musical button. You can change the colors too as the music plays. Try making shapes and letters in the music! 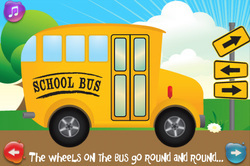 Each page is one verse of the classic Wheels on the Bus song, and the objects in each page are interactive. So while each verse of the song is played, children can click on the objects to watch them move or make a funny noise. This App combines paint by numbers with nifty sound effects. Each painting can be completed in ABC, abc, 123, or regular paint mode. The prize at the end of each painting is a musical rendition of a popular song. Highlights: The sound effects. Ready for a Refreshed Website or Logo in 2013?